The village of Pampaneira, in the Spanish Alpujarras, is still a largely unexplored destination. 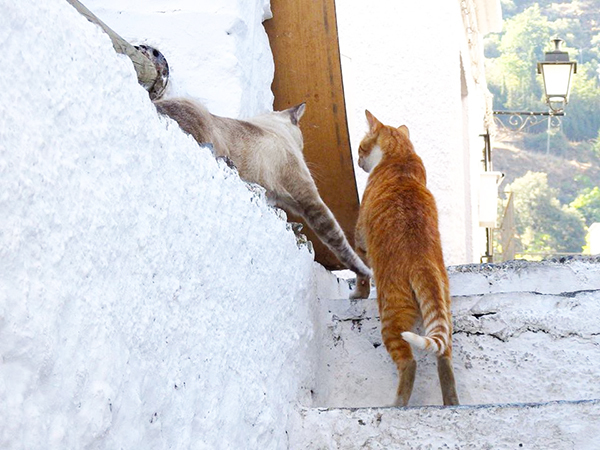 Yet almost all the travel photos of this mountain village have three things in common: picturesque whitewashed houses, magnificent views of the surrounding hills, and... cats strolling down the alleys. 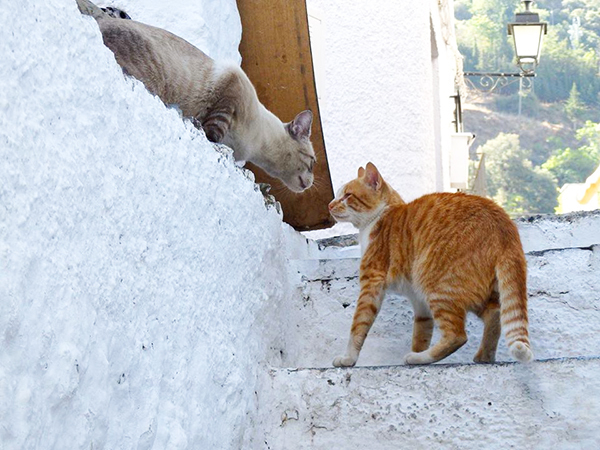 While these cats may not be Pampaneira's main tourist attraction, their omnipresence is definitely an advantage. 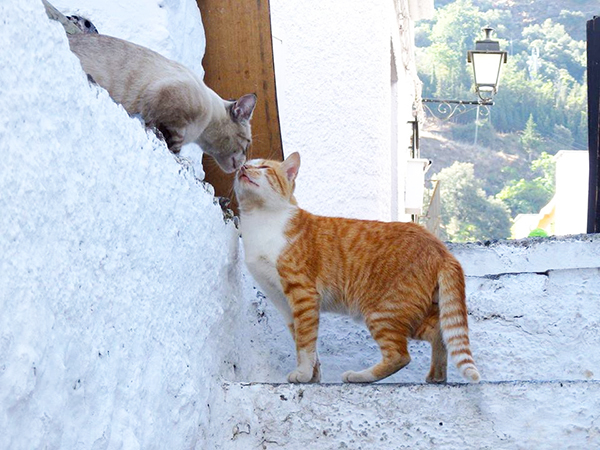 By the way, if you're in Pampaneira, you should also visit the nearby village of Capileira and its cats. Oh, they are so sweet! Lovely to see the interaction between the cats. "Unexplored" just means "Unexplored by humans". Cats are everywhere. I bet there are cats in Atlantis. They look like best buddies. They sure are cute and look like good friends! Gawjus kitties and such cute poses. meowloz two everee one in spain frum all oh uz in de land oh trout !! we LOVES fotoz one !!! 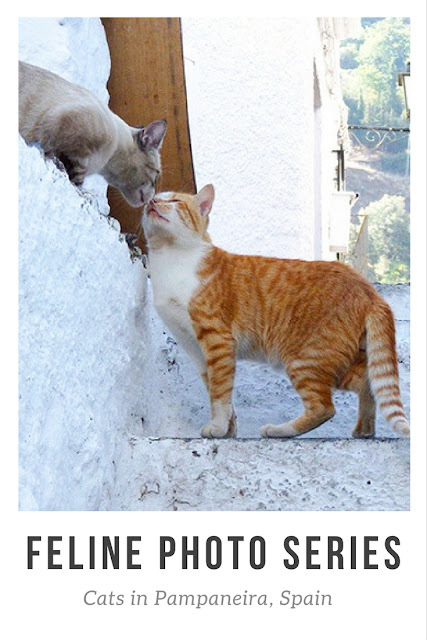 The kissing cats are so cute. 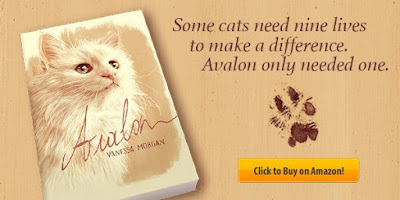 Adorable kitties and photos. Thank you for linking up and sharing your post. Have a happy weekend! A wonerful series of shots of these 2 cats. Have a lovely weekend. Awww such sweet friends. We have 2 and they are "not" fur friends!! Thanks or sharing on the #OMHGFF this week!! I love the photo of the two of them kissing! Adorable shots of the cats! Cute kitties - such sweet photos of them enjoying each other's company! Great pics! Thanks for sharing at the Weekend Blog Hop at My Flagstaff Home! The look like good friends. Sweet! It looks like they are smooching in the first one. These are great shots - the kitties seem to be introducing themselves and getting on just fine! Awww! Those shots are so sweet. I've got some nice ones of our animal shelter cat (and animal shelter dog) here in South Africa. Come link up on my WW Linky too! Very cute shots, with a beautiful background. Love these kitties, and the background is beautiful! Thanks for sharing...love your blog! Thanks for suggesting skim links and helping with it! That is such a great picture of the two cats. They sure do look like good friends. Your pictures are always good. Have a good day. 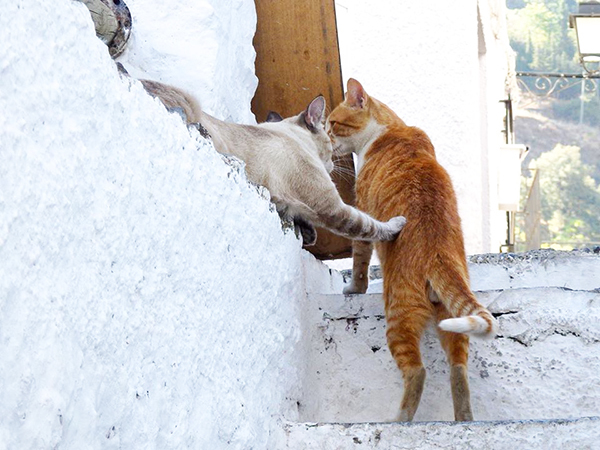 What cute photos of two kitties who look to be friends and having a good time together! So much love and romance in surroundings, great pictures. I'm from Spain and the Alpujarras have something special. Didn't know about the cats in Pampaneira though.